We study physical mechanisms of the hydrologic cycle with energy and material transport. The research topics include analysis and numerical modeling of hydrological processes such as surface-subsurface flow, atmosphere-land surface interaction with human activities. Based on the understanding of the physical process in hydrology, we develop fundamental technologies for river planning, water resources management, real-time hydrologic forecasting and water-related disaster mitigation. Currently, we focus on a development of a state-of-the-art hydrologic modeling system, a real-time flood forecasting system, advanced utilization of weather radar observation and a new theory of hydrologic frequency analysis. Climate change impacts on hydrologic cycle and water resources are also our important research theme. Spatiotemporal modeling of hydrological processes; Development of a real-time flood forecasting system; and Uncertainty analysis and scale issue of hydrologic modeling. Atmosphere - land surface interaction impact on hydrologic cycle; Land surface modeling considering human activities; and Applications of land surface model for global water resources analysis. Understanding the hydrologic cycle is the basis for river planning and mitigation measures against water-related disasters. We analyze hydrologic phenomena in various aspects and improve our understanding of the hydrologic cycle. The improved understandings are extended to advanced modeling of surface-subsurface flow and atmosphere-land surface processes. We also develop process models which represent human activities on the hydrologic cycle, which include water resources control such as dam reservoir operation, water withdrawal and irrigation processes. Figure 1. Spatiotemporal change of pressure head in a slope simulated by a 3D flow simulation model. Based on the sound understanding of the hydrologic cycle, we develop fundamental technologies for river planning and real-time hydrologic forecasting. Research topics include: Development of a hydrologic modeling system: A hydrologic modeling system supporting various types of hydrologic model simulation is developed; Development of a real-time flood forecasting system: A real-time hydrologic prediction system which incorporates data assimilation techniques such as Kalman filter, particle filter is developed; Advanced utilization of weather radar: Radar observed rainfall information is combined with a distributed hydrologic model to enhance the accuracy of flood prediction; and Hydrologic frequency analysis: A new theory of hydrologic frequency analysis is developed to support more efficient river planning and management. Figure 2. 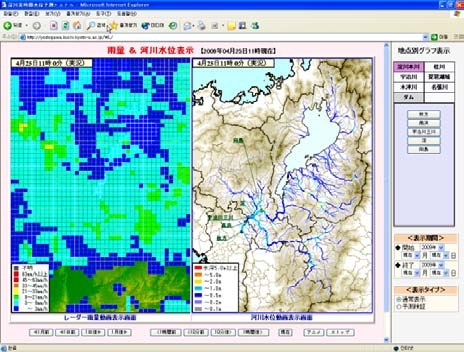 A real-time flood forecasting system providing 6hr-ahead river discharge for the Yodo River basin in Japan. Climate change will give us a serious impact on our life. We develop a method to diagnose hotspots of river discharge change, a down-scaling method of GCM outputs for local scale water resources analysis, and a bias correction method of GCM output for proper river discharge projections. Then we analyze a change of future hydrologic cycle to examine the impact on water resources and to detect the changes of frequencies and magnitudes of water-related disasters. Figure 3. Difference of annual mean precipitation of the end of 21st century and current climate simulated by a GCM. The hydrologic cycle is the central focus of hydrology. Atmosphere-land surface interaction plays a dominant role on the hydrologic cycle. We develop a land surface model including agricultural human activities. Using the developed land surface model, spatiotemporal changes of hydrologic variables are globally analyzed. We also study an advanced use of the earth observation satellite data to develop a land surface model and to evaluate the estimated hydrologic variables. Figure 4. Annual mean soil wetness (1986-1995) estimated by our land surface model.